← What can I do? I’m only a kid! When I was a teenager, I used to babysit for a family down the street that had a candy drawer. It was, just as it sounds, an entire drawer full of candy. After dinner, if it was a weekend, the kids could each pick one item out of the drawer. And once they went to bed I would settle on the couch with a selection of licorice, gummy worms, and various chocolatey treats and devour them until my teeth ached. I remember this particularly because back at my house, we definitely did not have a candy drawer. To be fair, I probably didn’t have enough self control to have a drawer of candy, and we did have a cookie jar filled with homemade goodness, but as everyone knows, cookies aren’t candy. The obvious annual Halloween bonanza. The customary giddy anticipation of corner store candy purchases where I could spend my allowance however I wanted (generally a box of nerds, a ring pop, or a lick-a-stick because they lasted the longest and I have long been a girl who values a good deal). Skittles. My Dad would occasionally come home with a coveted package of these shiny fruity wonders. I associated Skittles so closely with being a “Dad candy” that I was actually surprised years later when I realized that anyone could just walk into a grocery store and buy them. 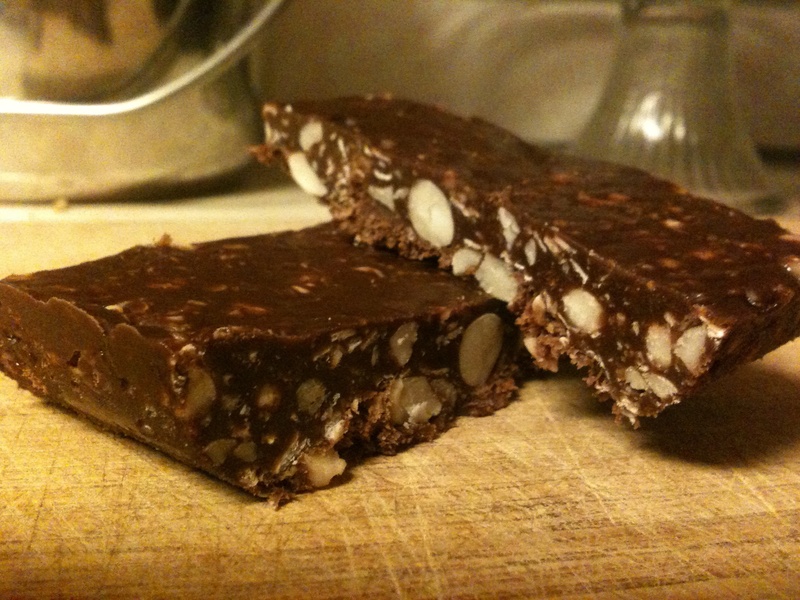 Anyway, today I unexpectedly discovered that my Whitewater cookbook had a recipe for eatmore bars in it. Even after all my do-it-yourselfing it never even occurred to me that I could MAKE them. And now, after all of 5 minutes, I have a whole pan of candy bars in the house. If only I could figure out how to make skittles, I’d be set. . . I madeup my own recipe,because I can’t tolerate the sweetness in candy and desserts anymore, so I make things much less sweet. One of the things I love about cooking and baking is knowing all the ingredients. I might have to try this recipe to see if the kids would eat it. I’m always on the look out for picky picky kids kid-friendly recipes. Thank you!